This recipe was originally shared with Go Dairy Free by Melody Wren of The Cook’s Kitchen. She adapted it from the May 2005 issue of Canadian Living magazine. We have adapted it yet again with a few fixes and an optional glaze! Preheat your oven to 375ºF and line two rimmed baking sheets with parchment paper. In a large bowl, toss together the apples, rhubarb, ¼ cup sugar, flour, lemon juice, and cinnamon. Unroll one sheet of pastry onto each prepared pan. 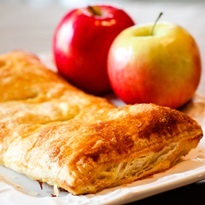 Spoon half of the apple mixture lengthwise along half of one pastry, leaving ½ inch border uncovered. Repeat with the remaining filling and the second pastry. In a small bowl, whisk together the egg yolk and water. Brush a little over the border of each pastry. Using the parchment paper to lift, fold the uncovered pastry over the filling of one turnover. Use a fork to press the edges to seal. Repeat with the second turnover. Brush the tops with the remaining egg wash.
Cut 4 evenly spaced 2-inch slashes in the top of each turnover. Sprinkle the tops with the remaining 2 teaspoons sugar. Bake in center of your oven until the pastry is golden and the filling is tender, about 40 to 45 minutes. Remove the turnovers to a cooling rack to cool before serving or glazing. In a medium bowl, whisk together the powdered sugar, 1 tablespoon milk beverage, and vanilla until smooth. Whisk in up to 1 tablespoon of addition milk beverage if needed to reach your desired consistency. Drizzle the glaze on the cooled turnovers immediately before cutting and serving.